We’d love your help. Let us know what’s wrong with this preview of Across the Way by Amy K. McClung. Love never factored into her agenda, but sometimes fate alters plans. Marie has her twenties planned out. Her dream to see all fifty states before she turns twenty-five finally comes true. With a two-year trip ahead of her, she says good-bye to her family and her best friend Jayce. Though fearing the trip could change their friendship forever, a pact is formed. They're de Love never factored into her agenda, but sometimes fate alters plans. To ask other readers questions about Across the Way, please sign up. This story is about Marie, who is going on the road trip of a lifetime to cross an item off her bucket list. She starts in Kentucky and drives up north into Canada and back down the east coast, and then heading west. The places Marie went were nice--it was kind of really cool to see North American geography and landmarks through someone else's eyes. What she felt important to show to me. I've never been to Michigan on the lake, or New Orleans, and it's been years and years since I was in New Yor This story is about Marie, who is going on the road trip of a lifetime to cross an item off her bucket list. She starts in Kentucky and drives up north into Canada and back down the east coast, and then heading west. The places Marie went were nice--it was kind of really cool to see North American geography and landmarks through someone else's eyes. What she felt important to show to me. I've never been to Michigan on the lake, or New Orleans, and it's been years and years since I was in New York, so it was kind of cool to live those places, even if it's through someone else (someone fictional at that... I really need to get out more). My biggest gripe was mostly that Marie meets some interesting characters, especially in the beginning. The old man in the dinner, Sami and Kat--and once she's out of their down, we never hear from them again, but Marie swore she'd stay in touch. I would have loved to have seen a FaceTime with Kat and Sami after they got engaged, or something. Just to bring them full circle and keep them in her life. Marie has been working hard to save money to go on a trip across parts of the US and Canada before she settles down into her career and future. She has a goal of certain places to see and wants to live life more as she has never left Tennessee up to this point. Jayce Hewitt is Marie's best friend and has been saving his own money to help Marie with her journey and when Marie no longer needs his money they decide that he will meet up with her at certain points on the trip. Jayce has feelings for M Marie has been working hard to save money to go on a trip across parts of the US and Canada before she settles down into her career and future. She has a goal of certain places to see and wants to live life more as she has never left Tennessee up to this point. Jayce Hewitt is Marie's best friend and has been saving his own money to help Marie with her journey and when Marie no longer needs his money they decide that he will meet up with her at certain points on the trip. Jayce has feelings for Marie and he hopes they will finally be able to move past the "friend" zone. Brady is not someone Marie ever thought she would meet on her trip yet when she does all her inhibitions are gone and she embarks on a week of passion with him that gradually leads to more through Marie's trip. Will Marie be able to discover herself through her journey and be able to decide which is the right guy for her in the end when she must make a choice? I really enjoyed this book and the trip is definitely something I would have loved to do. I was so glad she met Connie, Jayce's cousin, and was able to do it with her. The girls had so fun together and I loved reading the different reactions they had to the different places they went. At times I was definitely frustrated in the book when Marie was trying to choose between the two guys and who she cared about. I knew who I wanted to win her heart and I just wanted to get in there and lead her to who I believe she should be with. I found some of the advice Marie was given, like from Parker, interesting and was waiting to see what would happen from that. I loved Buddy and I wish Marie would have talked to him again before the end of the book as I loved his view on love and life! A great book on self discovery! I loved Marie's character in the book. She was fun-seeking and adventurous. She decides to do something many of us don't get a chance to do--she pursued her bucket list and traveled across the country on an epic adventure. 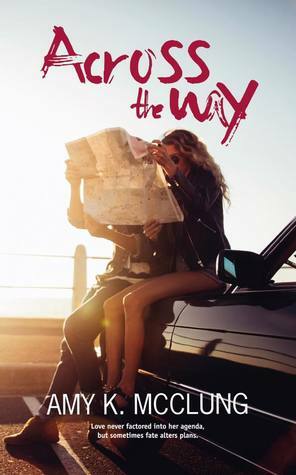 Along the way, she finds a deep friendship with a woman named Constance and also finds a strong romantic Across the Way is a story of love, of identity, and of making difficult choices. This book pulled me in from the first page and didn't let me go until the emotional ending. LOVED LOVED LOVED this book. I have always wanted to take a trip like Marie did. So many emotions in this book. I hope there's a book about Manny next. First off, BRAVO!! to Marie for taking a road trip that many of us have on their bucket list, but won't do for many reasons. Mine would mainly be the traveling alone. Don't think I could do this alone. OK, well we all know that being alone changes if you read the story, but still for most of the trip she was alone. Brave, strong, has a big heart and fearless is how I would describe Marie. Her co-travelers Connie and Manny were a nice added bonus. Besides missing her family she is going to miss h First off, BRAVO!! to Marie for taking a road trip that many of us have on their bucket list, but won't do for many reasons. Mine would mainly be the traveling alone. Don't think I could do this alone. OK, well we all know that being alone changes if you read the story, but still for most of the trip she was alone. Brave, strong, has a big heart and fearless is how I would describe Marie. Her co-travelers Connie and Manny were a nice added bonus. Besides missing her family she is going to miss her partner in crime, Jayce. This is her BF and she can't imagine her life without him. They make a pact to see each other every few months in one of her cities on her bucket list. She meets some amazing people, well OK some scary people too on her road trip. One of the people she meets, is Constance AKA Connie, Jayce's cousin from Canada. You will instantly fall in love with her, though she breaks my heart. Cries in corner! Why you say? Ha, as if I am going to let the cat out of the bag. Lips are sealed, but you just might want some tissue on hand. There are two amazing people and the decision is going to be one of the hardest Marie will ever have to make. Parker is someone she meets in a diner and gives her some good advice. Though I feel that Connie and Manny gave her some as well. Seeing as they could have been one-sided and were not is what makes their friendship so much more real than fictional. While my heart broke for the unchosen one, I felt that it was for the best. Marie was not ready for something and I don't think she truly would have been 100% happy. OK, this part of the review is hard cause I want to say more and cannot. It will give the result away and I am not saying who or what happens. I will say that from the first chapter you are hooked and then as you see this section again down the road you are like who is it? Cause we never knew their last names so it kept us in suspense. Oh my tummy was twisting here, then it was relieved and then it was twisted again when some unexpected visitors came to visit. Be still your heart is what I will say! In the end it was the right decision, but it doesn't make it easier for Marie and TEAM XXXXX either. Ha you won't figure it out either cause the X's equal the same for both characters. One of the things I did feel was missing though was background on what happened to those she met on the road that she was to keep in touch with. We never heard anything else on Sami/Kat, the Old Man or the Married guy in the hotel that met. Did they keep in touch? Other than that it was an adventure that we got to live through each state. This is great for us folks that will never see those states, so we got a little history from Marie and friends to fulfill our state checklist. Okay so let me start by saying I am not a triangle type of girl, a good menage yeah but triangle no. Having said that I did actually enjoy this book. The bouncing between guys not physically but more emotionally was annoying but Marie wasn't doing it in a mean way(if that makes sense). This book kept me hooked and turning pages. I enjoyed the witty dialogue and really felt like I could experience the road trip with the girls. I was extremely invested in the characters and story. I also enjoyed t Okay so let me start by saying I am not a triangle type of girl, a good menage yeah but triangle no. Having said that I did actually enjoy this book. The bouncing between guys not physically but more emotionally was annoying but Marie wasn't doing it in a mean way(if that makes sense). This book kept me hooked and turning pages. I enjoyed the witty dialogue and really felt like I could experience the road trip with the girls. I was extremely invested in the characters and story. I also enjoyed the cameo from the Parker-Harris series. Although I haven't read everything from this author I'm finding that when I pick up one of her books I can expect relatable characters, a fun story, and real emotions. Any McClung's "Across the Way" is an interesting novel. Marie has had a dream of driving her way through every state on the US. She meets a lot of people on her journey, does a lot of sight seeing, and takes her time in each state. Along the way she also finds the live of her life...it takes her over a year to figure it all out. The reader will be able to determine her answer much more quickly. I really enjoyed the characters in this novel. They all add different perspectives of their part in Marie's journey. They are well developed and relatable. They truly make this novel read worthy. While I enjoyed the premise of the novel, there were times I found it slow and was not able to hold my attention. What kept me reading were the characters and wanting to know what happened along the way. I do recommend this novel. It is a good read for a lazy day or a change of pace. I started reading this book after the author made me curious by saying that there would be something in it that I'd appreciate. I started reading Across the Way around noon and finished it about six pm in the same day. I absolutely loved the characters, they made me laugh, they made me cry, they made me yell out loud at them for being so stupid. I loved the love triangle, and I love the ending. Marie goes on a trip to visit every state, something I only hope to do sometime in the future, and alo I started reading this book after the author made me curious by saying that there would be something in it that I'd appreciate. I started reading Across the Way around noon and finished it about six pm in the same day. I absolutely loved the characters, they made me laugh, they made me cry, they made me yell out loud at them for being so stupid. I loved the love triangle, and I love the ending. Marie goes on a trip to visit every state, something I only hope to do sometime in the future, and along the way she finds love. And that is unexpected; she doesn't plan on finding love on her trip. But it doesn't come easily. The tension between the characters at times is so well written and the way it is resolved is fantastic. I have no words about how much I loved this book, besides that the ending made me so excited, because the plot was resolved. At times I was definitely frustrated in the book when Marie was trying to choose between the two guys and who she cared about. I knew who I wanted to win her heart and I just wanted to get in there and lead her to I really enjoyed this book and the trip is definitely something I would have loved to do. I was so glad she met Connie, Jayce's cousin, and was able to do it with her. The girls had so fun together and I loved reading the different reactions they had to the different places they went. Brilliant plot, awesome characters and very, very well-written. Holy wow. This book has you hooked from beginning to end. This was my first read by the author and a really good one. Marie has a dream of traveling the world. Her best friend Jayce isn't too keen on the idea. On her journey she meets interesting people. Distance makes the heart grow fonder. This book had me on the edge of my seat. I was team Jayce all the way. Brady was cool and all and every girls dream. I had to finish this book to know who she chose. This is a MUST read. Looking for Holy wow! I rarely write poor reviews. This book dragged on and one and honestly after just over half way through, I "skimmed" the rest to see who she chose in the end. It was like a never ending battle and for me that was annoying. The writing was just okay. I think it bored me more than intrigued me. This is a well written book about moments in life, the journey in life, and the loves in life. Suspenseful til the very end. While I did enjoy this book, at time it did frustrate me. The trip Marie took is something I would love to do myself. I loved the people she meet along th way, they were great and made the story even better. Each character in the book was unique in their own way. To get to what frustrated me was she was caught between two guys and trying to decide who she liked more. I knew who I was rooting for, but the back and forth really frus I was given a copy by the author in exchange for an honest review. To get to what frustrated me was she was caught between two guys and trying to decide who she liked more. I knew who I was rooting for, but the back and forth really frustrated me, other than that I did enjoy this one.